The PC3K, already loaded up with the many impressive features and sounds of the PC3, allows users to tap into the massive wealth of samples and programs developed for Kurzweil's legendary K Series over the past two decades. 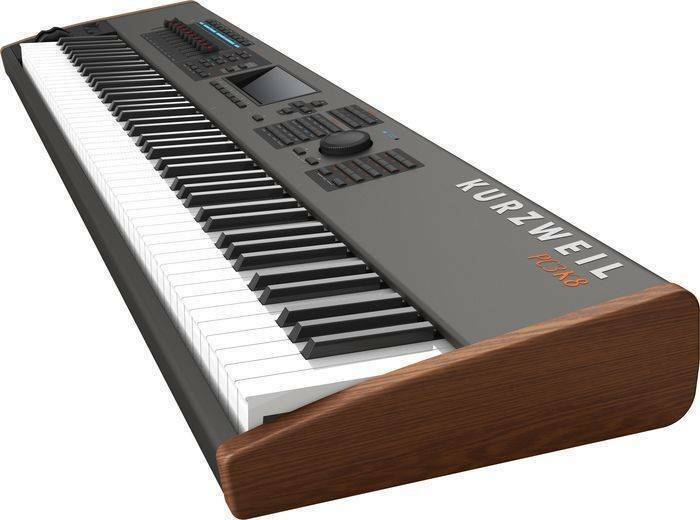 Capable of loading .KRZ/25/26 sample files, WAVE and AIFF files, as well as most of the K Series programs and setups, the PC3K presents a whole new world of choices to players, and once again underscores Kurzweil's commitment to the concept of non-obsolescence by design. You can choose to delve into the extensive libraries of existing K Series samples or decide to fill the PC3K's flash memory with your own signature samples. In either case, you'll have the most powerful version of Kurzweil's V.A.S.T technology ever developed at your fingertips to help sculpt your sounds and attain a level of detail and expressiveness truly worthy of your music. Sample files can be loaded via USB from a thumb-drive or directly from a computer. Expanding upon Kurzweil's V.A.S.T. architecture, the PC3X's new architecture delivers more power and flexibility combined with unprecedented ease of use. Users can now create and store their own DSP algorithms, with nearly limitless possibilities for routing. In another huge development, Kurzweil has resurrected the VA-1 Virtual Analog Synthesizer, having built it's synthesis engine right into the new system. Hear the VA-1's power-shaped, anti-aliasing oscillators (including supersaw, triplesaw, and hard sync oscillators) combined with a newer, larger set of V.A.S.T. filters (like the classic-style 4pole low pass w/ resonance) and non-linear processors and you'll understand why the internet is buzzing about this feature. I've had my PC3K8 for over a year. I love it, great editing software and the sound and features are second to none. I wouldn't buy any thing else, awesome. I've had many keyboards but the PC3K8 is a shining star compared to all others. Yamaha, Roland, Korg, etc all have strong points...but for sound quality, ease of use, the weighted keys, and overall looks...this 'board is a cut above. I'll never part with mine....until it quits and cannot be fixed. Wonderful keyboard synth, the weighted keys are perfect and the sound quality and variations you can edit into this instrument are fabulous. I've had many other 'boards, this one is the ultimate. And useable...you don't need to be a professor to understand the manual. The piano sounds are best out there, and the syth sounds and strings are best samples yet. Forget the others, Kurzweil deserves far more respect and notability than it receives. I own a PC3, PC3X, and PC3K8 that are all staged at different locations. I wouldn't part with any of them. Top quality. Great price. Hi I have had the PC3K8 for 6 months, it is awsome. I gave away my old Korg. Only problem was delivery - took forever to get it. Use is very intuitive, super workstation and editing features, I have only used a few. Really like the action, and the 88 keys. Dont know why Kurzweil gets trash talked.